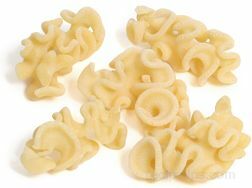 Most pastas have a similar flavor but when the sauce is added, the pasta and sauce create their own unique flavor. 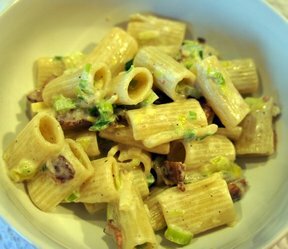 There are many types of sauces that can be used but some go better with certain types of pasta than others. 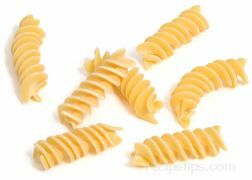 Some general guidelines for different types of pasta are shown below. Sauce: Light sauces, mainly used in broth or soups with a light base. Sauce: Generally not eaten with a sauce. 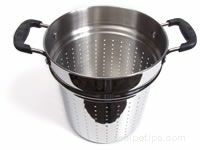 Used in stir-fries, soups and salads. The pasta should not be over-sauced. 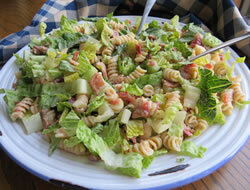 It only needs to be coated with enough sauce to allow the pasta to benefit from its flavor. 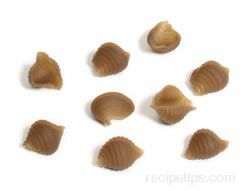 There should not be leftover sauce in the bottom of the bowl when all of the pasta has been eaten. 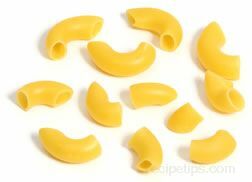 Shown below are some basic guidelines on adding sauce to the pasta. 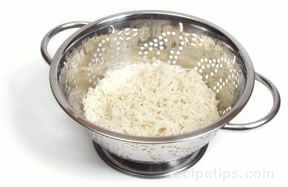 Drain the pasta and gently shake the colander, leaving a little of the cooking water clinging to the pasta. The light coat of cooking water will allow the sauce to blend and spread throughout the pasta more evenly. Add just enough sauce to evenly coat all of the pasta. 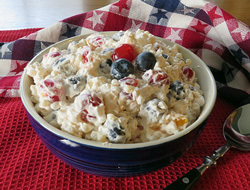 The sauce can be added using several methods. See methods below. 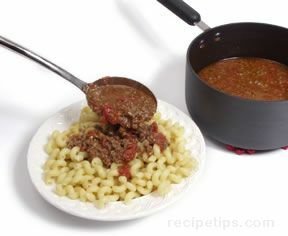 The best method for infusing the flavor of the sauce into the pasta is to pour the pasta back into the pan it was cooked in while the pot is still warm and then add the sauce to it or adding the pasta to a pan containing sauce that is already warmed. 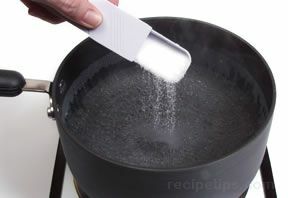 With the pan over low heat, stir and toss the pasta and sauce until the pasta is well coated. This will keep the pasta warm, infuse the sauce's flavor in the pasta and keep the pasta from sticking together. 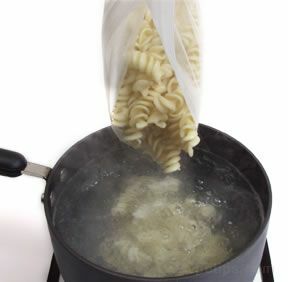 Limit the amount of time the pasta is returned to the heat source to 1 minute or less, otherwise it may become over-cooked. 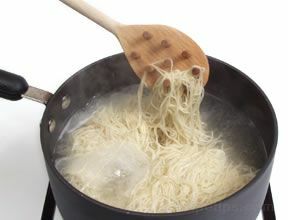 If cooking fresh or homemade pasta this method may not be the best to use because the pasta will overcook too quickly. 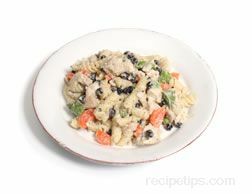 Once the pasta has been sauced, serve immediately in warmed serving bowls or on warmed serving plates. 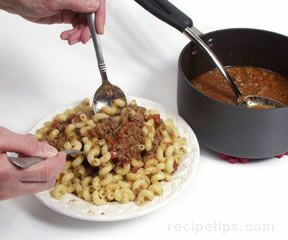 After draining, the pasta can be added to a warmed serving bowl or plate and the sauce can then be added. 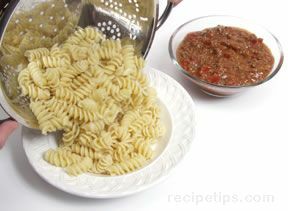 Toss the pasta and sauce together until evenly coated. 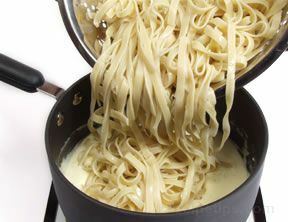 After draining, the plain pasta can be added to a warmed serving bowl, with the sauce added to another warmed serving bowl and then served separately. If serving in this manner, be sure the pasta is not drained completely. 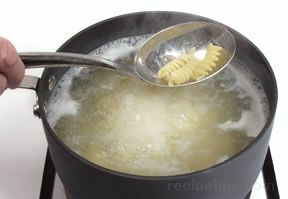 Leaving some of the cooking water on the pasta will help keep the pasta from sticking together. The pasta should be served immediately. 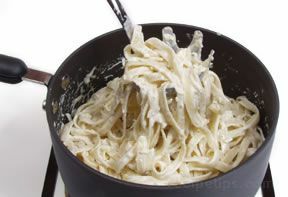 If it is not going to be served immediately, drain the pasta completely, put it back in the pan it was cooked in, and add butter or oil to keep it from sticking together.